Vitamin A is involved in the process of formation and preservation of function of epithelial tissues and mucous membranes, is important for fertility and is essential for vision. Vitamin D3 regulates and corrects calcium and phosphate metabolism in blood and plays an important role in the uptake of calcium and phosphate from the intestines. Especially in young, growing animals, Vitamin D3 is essential for the normal development of skeleton and teeth. Vitamin E is as a fat-soluble intracellular antioxidant, involved in stabilizing unsaturated fatty acids, thereby preventing toxic lipo-peroxides formation. Furthermore, Vitamin E protects the oxygen-sensitive Vitamin A from oxidative destruction in this preparation. Is a well-balanced combination of Vitamin A, Vitamin D3, and Vitamin E for poultry, calves, cattle, goats, and sheep. Prevention or treatment of Vitamin A, Vitamin D3, and Vitamin E deficiencies with Sorbitol in farm animals. Prevention or treatment of stress (caused by vaccination, diseases, transport, high humidity, high temperaturesv or extreme temperature changes). 1 ml / 10 liter drinking water for five to seven days. 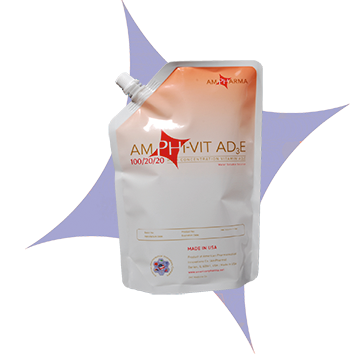 A Patented Proprietary Mix of Vitamin A, Vitamin D3 and Vitamin E.